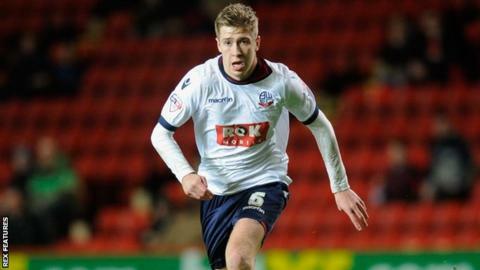 Bolton have not accepted a bid for Josh Vela despite reports they had agreed a £500,000 fee with Cardiff, says Trotters boss Neil Lennon. Vela, 22, has made 62 appearances for Wanderers, including starting Tuesday's 3-2 league loss at Sheffield Wednesday. Asked about Vela's situation after the match, Lennon said: "There's nothing on that. A bid came in but it wasn't accepted and that's it. "I spoke to Josh before the game. He said he hadn't heard anything." Bolton face a winding-up petition hearing on Monday and are trying to sell players in an attempt to avoid going into administration. Meanwhile, Lennon suggested that Mark Davies' proposed move to Sheffield Wednesday is in doubt. The Owls have had a bid accepted for the 27-year-old midfielder but are thought to be struggling to match the wages he earns at Bolton. "I don't know if a deal has been done or not. I might find out after here," Lennon said. "I don't mind if the deal's done, but nobody's told me anything. And it's the same with Zach Clough. It's becoming farcical now because there's no information." Wanderers have accepted a £2m bid for 20-year-old forward Clough from Bristol City. "He has been to Bristol, up and down for talks and nothing's happened from that, so it's become a bit of a pain in the neck to tell the truth," Lennon added. Bolton, who are now six points adrift of safety at the bottom of the Championship, would face a 12-point penalty if they were to enter administration.